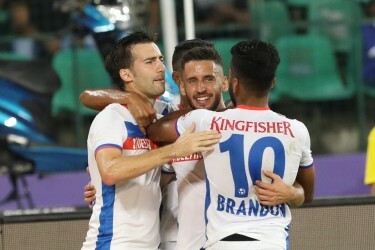 In what was seen as a game that threatened to head towards another goalless stalemate, the Indian Super League debutants Bengaluru FC ran away with the spoils of victory after Spaniard Eduardo Garcia's fine solo effort and Sunil Chhetri's finishing touch gave the southerners all 3 points against Mumbai City FC. The India custodian was not left with much to do in his first appearance in a blue shirt in the ISL. The 24-year old is eligible for the first five rounds of the ISL as he replaces the injured Lalthuammawia Ralte who is out for almost 4-6 weeks with an ankle injury. Playing at left-back, the defender gave a good account of himself as he maintained defensive solidity while bombing forward to assist Sunil Chhetri whenever possible. The Goan midfielder was on hand to clean up whenever Mumbai lost possession and was instrumental in keeping the play ticking as he provided a solid defensive screen for his back four. Was not afraid of putting his body on the line as he went head-on against Mumbai City FC's Gerson. The versatile midfielder was an energetic presence as ever on the right flank and made sure that the Mumbai City FC left flank never had a moment's peace as his combinations with Udanta Singh were always a threat. With 35 successful passes and a pass accuracy of 74%, he was a core element in every Bengaluru attempt in the final third of the pitch. Scored his side's second goal late into second-half stoppage time. The captain was as expected in the thick of things as he started the game on the left but had a free role to cause havoc. When he drifted centrally, he looked to create chances for debutant Miku to capitalise which included a sublime through ball to the Venezuelan who was unfortunately in an offside position. He also had 2 shots on goal, one of which was a volley in the first half that nearly found the net. Was unfortunate to see yellow for an alleged dive inside the Mumbai penalty box. At length, an all-action display from Bengaluru's Captain Fantastic. Bengaluru have a gem on their hands in the 22-year-old who is nicknamed 'The Flash' for a reason. His speedy runs on the right flank along with Harmanjot Khabra stretched the Mumbai defence on many occasions over the course of 90 minutes. All of his 4 shots on target were a result of his speed on the flanks and his ability to get past the defence with ease. Replaced by Subhashish Bose, 10 minutes from normal time. Was sent on by Roca to tighten things at the back as Mumbai looked to add more impetus in the final third. The former Bengaluru man saw his goal being put under siege by numerous attacks from his former employers but was on hand to deal with them with a cool head in the first half. Could not do much about the goals conceded but seemed to cut a frustrated figure as the match wore on. Given the task of handling the flank that had Sunil Chhetri, the defender kept up with the India skipper on most occasions but was dragged inside out on occasions by the guile of the Bengaluru skipper. The youngster was asked to consolidate a midfield against the likes of the giant Erik Paartalu and Lenny Rodrigues. Showed a lot of heart against physically imposing opposition players but was unable to create any telling impact. Was replaced by Mehrajuddin Wadoo at half-time. The attacker had a few moments where he looked threatening but was well dealt with by the Bengaluru defence. Looked to get behind Rahul Bheke on occasions but his influence was minimal in proceedings. The midfielder was needed to add more bite to the midfield but was by-passed on more than one occasion by a slick Bengaluru midfield. The youngster's flank was constantly the outlet that the home side used to start attacks. He was roasted on multiple occasions by the pace of Udanta. Alexandre Guimaraes, however, persisted with him even after the interval and freed him from his defensive duties when Raju Gaikwad was asked to switch flanks. The defender was part of the defensive reinforcements that helped shore up Mumbai City's back four and did a competent job.